The Gender and Development office started conducting the series of Seminar-Workshop on Gender Analysis which aims to capacitate all faculty and employees on analyzing the gender responsiveness of Program, Projects and Activities (PPAs). That is, ensuring that concerns particular to women are included in the conduct of development initiatives. CSU-Gonzaga hosted the first batch along with Aparri and Lal-lo campuses last September 20-21, 2017 at CSU-Gonzaga conference hall. 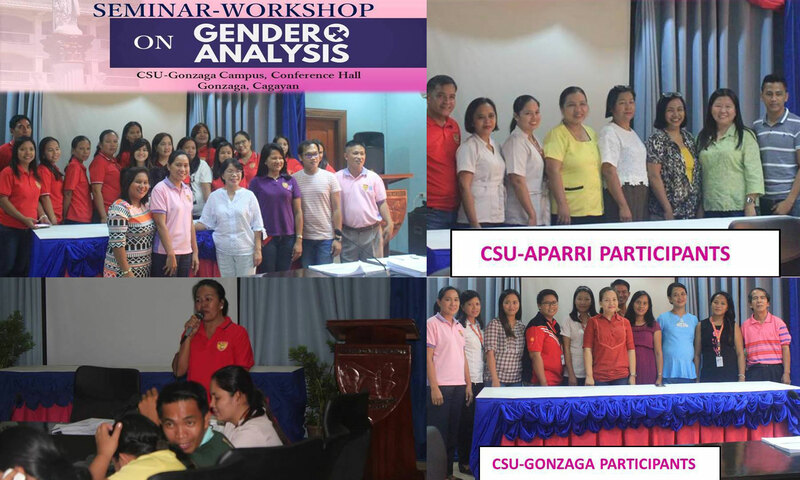 The Technical providers of the said activity were Dr. Jocelyn Tuscano, University GAD Focal person & PCW Certified Gender Resource Pool member, Dr. Chelito Malamug, GAD TWG member, CSU Andrews, Prof. Wendy Joy Garma, GAD Focal Person, CSU-Gonzaga, Ms. Norlizah T. Reyes, Member of GAD TWG of Carig, Dr. Verlino D. Baddu, GAD TWG Member and Dr. Remelyn C. Bautista, GAD Focal Person, Sanchez Mira campus, these advocates shared their expertise on Concepts of Gender and Development (GAD) and Gender Analysis. The Specific topics discussed were Basic Concepts on Gender, GAD as an Approach to Development, Gender Analysis, as well as various tools for Gender Analysis Workshop. Towards the end of the Seminar-Workshop, participants identified the different gender issues in their campuses that need to be addressed. Further, through the use of Gender Mainstreaming Evaluation Framework (GMEF) participants evaluated the extent of Gender responsiveness of their respective campuses. Significant output of the workshop was accomplished as the campuses surge to level 3 or the level of GAD Application using the GMEF as a tool. On the other hand, the Harmonized Gender and Development Guidelines (HGDG) tool helped them assess the gender responsiveness of their PPAs be it on-going, proposed and completed. With this, the Cagayan State University is confident enough that the PPA implementers seek to bring about a more balanced relation in the design and implementation of Programs, Projects and Activities.